More hops please! What’s better than cold San Diego brews paired with amazing food? How about beers specially created to have your readers exploring the hidden flavors of already mouth-watering dishes! 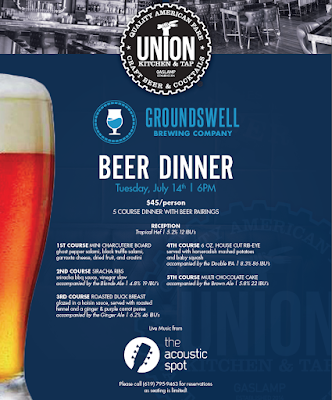 Union Kitchen & Tap, in the heart of the Gaslamp, is hosting a 5 course beer dinner on Tuesday, July 14, with Groundswell Brewing Company that is too delicious to miss! 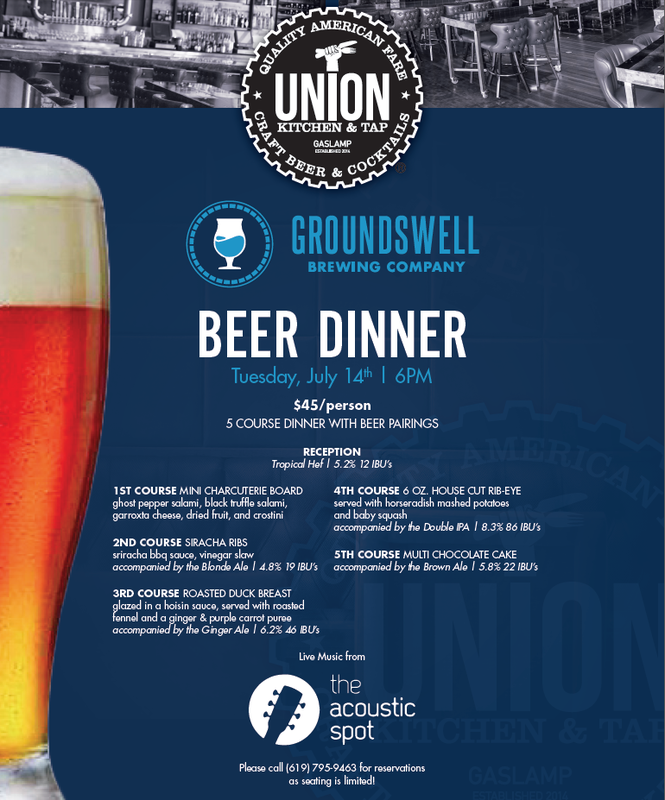 Groundswell Brewing identifies itself as a “brewer and culinarian” - each beer is brewed specifically with meal pairing in mind. This unique dinner is meant for diners to understand the complexities of tastes with the help of a little libations! Each ticket is $45 per person and includes a five-course dinner paired with brews such as the Blonde Ale, Ginger Ale, Double IPA, and the Brown Ale. Courses to be served include a mini charcuterie board, Siracha ribs, roasted duck breast, house cut rib-eye steak and a multi chocolate cake, all enhanced by the tastes of the local hops. The dinner will also include live acoustic music from the Acoustic Spot. Spark your taste buds with a new kind of pairing dinner! Seating is limited, so call (619) 795-9463 to make reservations. Union Kitchen & Tap is located at 333 5th Avenue in downtown San Diego.